I’m excited about this new assignment – a short article about the Seven Wonders of the Ancient World. I loved the research. I checked out every book from the children’s library section in our county – some were good, some were okay, and some were downright boring. How could this be boring? So here is my short list of top “Wow, that’s something!” gleaned from the research. The Great Pyramid: The only wonder that is still standing. But contrary to lots of articles, the pyramid was not built by slaves but willing volunteers (probably farmers during off season) to help and honor the Pharaoh. The Lighthouse at Alexandria: They discovered the mirror and used a sheet of metal to reflect the sun out to sea. The Hanging Gardens of Babylon: Equally as astounding as the gardens supposedly were, the wall around the city was so thick and wide, that chariots could drive by each other like a 2-lane highway. 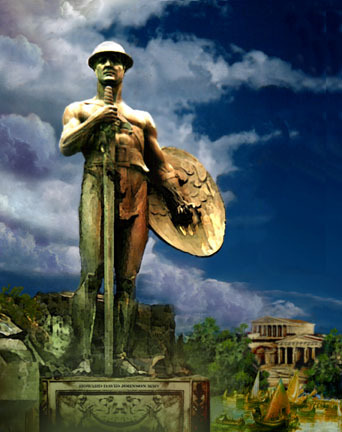 The Colossus of Rhodes: He was made of brass plates. When he crashed to the ground from an earthquake, you could walk through his body parts. The Mausoleum of Halicarnassus: Who knew that the word “mausoleum” comes from this huge tomb built by King Mausolus? Of course, on the roof of his tomb, he had huge statues of a chariot of gold with 4 horses, and he was the driver. The Temple of Artemis at Ephesus: Super ginormous temple all made of marble. Writers said it seemed to float into the sky. This entry was posted on Wednesday, February 27th, 2013 at 10:44 am	and posted in Blog, Magazine Articles. You can follow any responses to this entry through the RSS 2.0 feed.